In the latest edition of Ovation International, there is an engaging interview with Jerry Rawlings, former President of Ghana. It is worth reading; I have read it. And I can attest that despite Rawlings's limitations, the entire package, which is to be continued in a subsequent edition of the publication, underlines for me certain essential differences between Nigerian leaders and the recent set of leaders that emerged in the country that used to be known as Gold Coast. Comparing Ghana and Nigeria is fast becoming for me an interesting sport, but is it not the case that it is through such comparisons that useful light can be thrown on human circumstances? 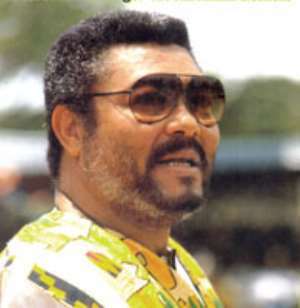 Jerry Rawlings needs no introduction. He is the leader of the revolution that rescued Ghana from the doldrums and set it on the path of renewal. By the time Rawlings left office four years ago or so, Ghana had become a classic example of how committed leadership can save a country from ruin. Nigerians would recall how in the eighties, Ghanaians had become economic refugees in Nigeria. Graduates among them took up menial jobs in Nigerian cities, jobs that Nigerian graduates would never accept: shoe-mending, site labourers, messengers. But the average Ghanaian had no option. His country was down. Life had become brutish in Ghana. In about twenty years of his engagement in his country's public sphere, however, Rawlings changed all that. He rescued his country from the thieves, restored values, and rebuilt the society. He qualifies to be described as the father of contemporary Ghana. By the time he handed over to the present President, John Kuffour, a foundation for the future had been laid. Democracy had been restored. Ghana had found its feet. That country's success is to be measured in terms of the reversal of roles between it and Nigeria. Today, many Nigerians are rushing to Ghana, not as refugees, thank God, but in search of a more enabling environment for self-actualisation. There have been rogue leaders in different parts of Africa and there is perhaps merit in the assumption that they are the products of their own environments, or that every country at a point in history deserves the kind of leaders that it throws up. But there have been good leaders as well, whose personal examples and life outside office serve as useful reference points. In this category, the most celebrated figure is Tanzania's Nwalimu Nyerere, whose individual austerity and self-denial, and detestation of ostentation lent his leadership style the stature of a spiritual and historical mission. Jerry Rawlings has had a few spats with his successor, based largely on party politics, but from a distance, from a Nigerian observatory, Rawlings in retirement, presents a profile that is not readily available in Nigeria. The interview is largely biographical, from childhood to adulthood, from his initial love of flying to air force school and eventual emergence as leader and historical figure, from his private humble beginnings, to marriage and life in the public arena. The story is illustrated with photographs of Rawlings's two homes, one in Accra, and a country home in the Volta region. What strikes me at first is the modesty of Rawlings's circumstances. He has two homes, one wife, four children and many dogs. We are given the opportunity to have glimpses of the two houses and their interiors. By Nigerian standards, Jerry Rawlings is a poor man. His houses do not look half as impressive as those we see in Nigerian home videos. Bank MDs in Nigeria live in better environments, even. And here we are, seeing Rawlings and his one wife, posing all over the place, looking very happy in their surroundings. Former leaders in Nigeria do not talk about one or two houses, they own estates, and acres upon acres of land! They also set up big businesses with public funds; they make sure that for the rest of their lives, they remain very big men. Throughout the interview, you could see Rawlings insisting that he is a man of modest means, and Dele Momodu and his team, being Nigerians trying to suggest that this is not possible. We soon reach a point where the interview focuses on Rawlings's cars. He loves Jaguars. But it is soon obvious that what the former Ghanaian President is romanticising is what is known in Nigeria as Tokunbo: "We got it in just before its tenth year because when I was in office we wouldn't allow cars beyond ten years. It is an XJ. We got it in here in the late 1990 just before we left office. The other one too." And wonder of all wonders, Rawlings allows himself the fun of posing beside this Grade A Tokunbo! Can you imagine a former Nigerian leader doing this? In the first place, it would be considered impertinent for any journalist to ask a former Nigerian President about his cars. Why count skulls in the House of death? I dare say that even the children of Nigerian leaders at the lower levels: Perm Secs, Chairmen of Corporations are richer than Rawlings. The way this former President complains about denial of privileges by the Kuffour administration and how he had to take a loan to pay his wife's medical bill of about $22, 000, it is obvious that the man does not own businesses of his own or investments that generate the kind of funds that Nigerian leaders have at their disposal. He only opened a Swiss account years after leaving office and only because his wife needed to go for medical treatment in Switzerland. And then in Switzerland, he and his wife had to rely on the Ghanaian embassy for transportation. The couple chose Switzerland because the cost of treatment in that country is cheaper than in the United States: "...It was in Switzerland because it was cheaper than the US. Can you believe that an ambassador, a career diplomatic (sic) would not allow the driver, a Ghanaian to take her in an embassy vehicle. The driver got angry, slammed the keys on the table and went to take her in his private car. People are shocked when I say these things but they are happening." I am not too sure that a former Nigerian President can find himself in this kind of situation. Even the ones among them who do not appear corrupt, and seem genuinely modest are not likely to go about losing sleep over a sum of $22, 000. In any case, the government of the day would pick up their bills. Governors will make donations. Companies will contribute their own widow's mite. There are many former leaders in Nigeria today, President or not, who are living a well-subsidised life at public expense. A friend has drawn my attention to the fact that Rawlings lives in a well-appointed home. Well, I wasn't expecting him to live in a cow shed. But it would be interesting to know whether those houses are his and how many houses he really owns. He comes across as a man of minimal needs. The problem with Nigerian leaders is their greed. Rawlings complains about corruption with a passion. Nigerian leaders may well do so when it is convenient for them, but how many of them live within their means? In the next instalment of the Rawlings interview, Ovation magazine should try to find out whether Rawlings owns a bank, a ship, a private jet, a big business, chain of houses, acres of land, any other thing that money can buy. Does he have any house built for him by contractors as back-payment for favours he had done using his office? Does his wife have bank accounts that are permanently yielding fat interests? He also comes across as a family man. He and his wife are shown posing all over the place. Very few Nigerian leaders can do this. Even when they are married to one woman, their commitment to a number of other women who are either their mistresses or mothers of their children cannot allow them engage in the kind of show of public affection that the Rawlings have put on display. But what is even more remarkable is that Rawlings today is a free man. He moves around the country freely and with confidence. He is shown for example relating with people on his way to the Volta region. His interviewers remark upon his popularity among the people. When Nigerian leaders leave office, they try to avoid the people. One former leader in Nigeria was once stoned at a public function. Before he ventures out of his house, I suppose he has to worry about security implications! There are Nigerian leaders and they know themselves who cannot stand on the streets of Lagos or Kaduna and address the people. They will be booed. Rawlings looks like a man who is able to have a good sleep at night. He is reminded of the fact that he is a "coupist". He immediately insists that he led a revolution and he goes ahead to justify the revolution. Is there any former military leader in Nigeria today who can speak of a revolution? Perhaps, there were only two revolutions in a real sense: the January 15, 1966 coup and the Biafran revolt but both were aborted. Nigerian leaders have to worry about how they will be remembered. I am not saying that Jerry Rawlings is an angel. No man can be an angel. Rawlings must learn for example to stop heckling Kuffour. He must resist the temptation to give the impression that he is missing power, and suffering from a certain withdrawal syndrome. The moral of my story is that Nigerian leaders must learn to moderate their greed. Public office in this country is seen as an opportunity for corrupt self-enrichment. Governance in this land is not about values but getting a big share of the national cake. Those who claim to be fighting corruption in Nigeria are either hypocrites or closet blackmailers. They talk about integrity and transparency only when it is expedient to do so. The prevailing logic is that only a man who is not smart enough gets caught. What we need to do is to change the structure of government business. In the same Ovation magazine in which Rawlings appears, photographs have been published and interviews have been conducted with Nigerian leaders and citizens, and the typical Nigerian tendency to flaunt wealth and boast about unmerited favours is writ large. What we must sell is a different value system which would enable our leaders to go into retirement, like Rawlings, as men who have learnt to love God and their fellow men. FOR the benefit of persons who are not very familiar with the publication called Ovation International, it is the magazine which has been built into a successful business and brand by Dele Momodu, ex-African Concord, ex-Weekend Concord, ex-Classique, and easily one of the most reassuring practical models of the vast opportunities that await those who are willing to dare and dream. Dele Momodu is courageous. He loves to stretch his dreams beyond the end of the street.